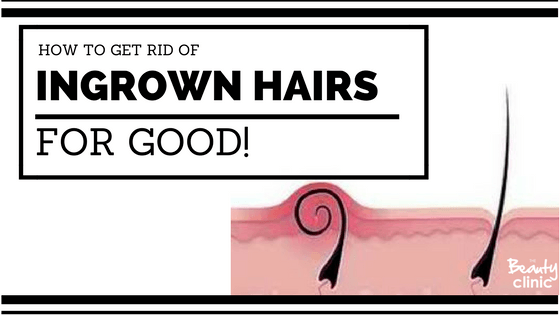 How to get rid of ingrown Hairs……FOR GOOD! Written by Admin on January 17, 2018 . Posted in IPL Hair Removal. We see a lot of women (and some men), sometimes as often as on a daily basis, that suffer from ingrown hairs. For some, this may happen every so often but for others it may be a constant source of pain & irritation. Most commonly a small red bump occurs which subsides on its own; for others it can mean extreme pain and discomfort as those ingrown hairs can grow larger and larger in size and sometimes become very serious and need medical attention if not treated right away. When you shave or wax, your hair immediately begins to grow back, but now a layer of skin has covered the hole where the hair was once before. The hairs simply continue to grow but now they grow beneath the skin and begin to curl as they have nowhere else to go. As the skin is a very powerful organ it responds to the trapped hair growing under the skin with redness, swelling, itching, pain and then possible infection, known as folliculitis. Our first reaction is to remove it by any means necessary (PICKING!) which in many cases can lead to trauma of the skin and possible post inflammatory hyperpigmentation or scarring. IPL Hair Removal is your answer. IPL Hair removal is permanent Hair Reduction (Read our Blog to find out the Truth about IPL). IPL destroys the hair follicle at the root and detaches its blood supply, this stops the hair from growing back. A simple method of NO Hair = NO Ingrown hairs. IPL Hair Removal takes 8 Sessions for dark hair & 12 sessions if it is white/blonde/red hair. ( YES We can treat white Hair, Read about it Here) with intervals of six to eight weeks, so if you want to be hair free by next summer NOW is the time to start, although most notice a huge reduction of ingrown hairs after the first few sessions. We have treated many clients who had suffered tremendously with ingrown hairs and who made the decision of IPL hair removal and never looked back. Who doesn’t want to be Hair free and care free! If you have any further questions about IPL Hair Removal please book yourself a Complimentary Consultation and let one of our highly trained therapists walk you through the options available to you. If IPL is too big of a step we stock a wide range of Ingrown Hair treatments that can help.